It’s almost time to prepare for that special family day, the Thanksgiving lunch or dinner. 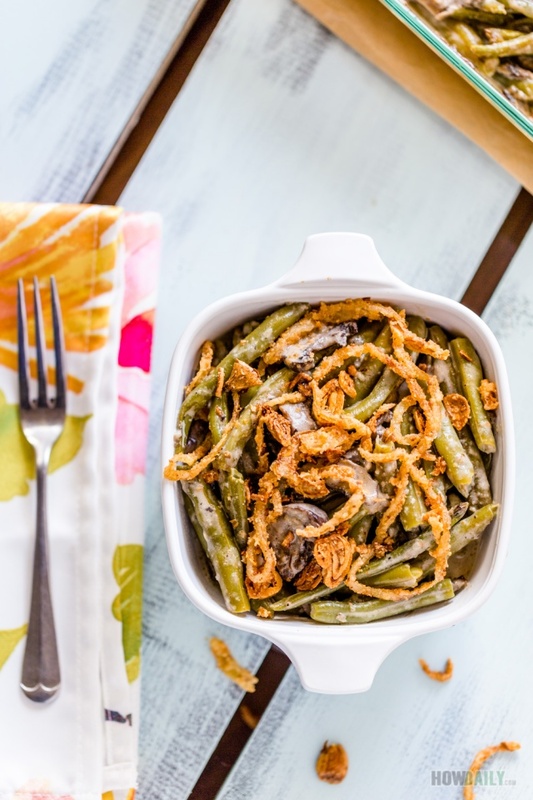 Every year, along with turkey and marsh potatoes, green bean casserole with creamy mushroom sauce and grizzly crispy French fried onion always the first dish to be cleaned. The taste is just perfect, a blend of everything: creamy, salty, sweet and minimal spicy. Not to mention the crispy onion ring and aromatic shallot topping, we always have to make some extra on side for the kiddo to spray on. This recipe was observed from here and there. The fastest option would be to used canned french fried onion, canned mushroom soup, but hey, what’s the point of cooking and gathering. The dish just taste a whole lot better when making from all raw and fresh ingredients. 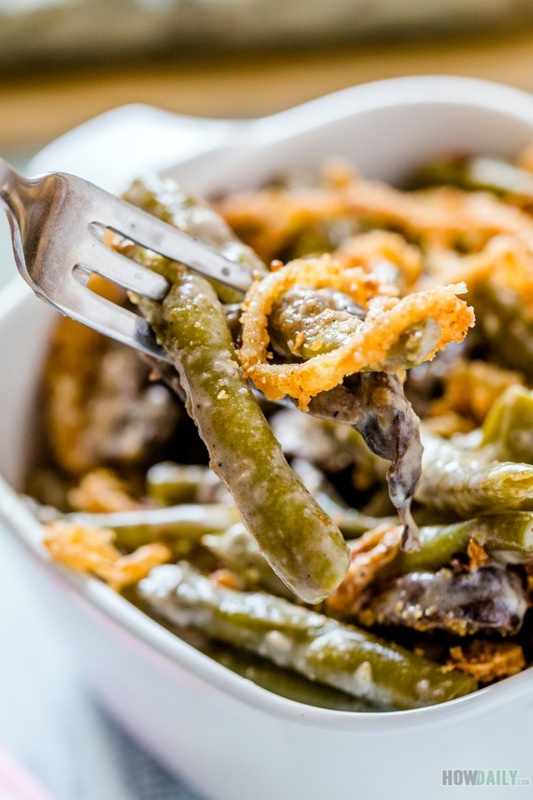 So if there are a lot cooking to be done on Thanksgiving day, plan a head and chill the green bean and topping separately. You only have to heat up and bake a few more minute right before serving. Another note is on the fried onion for topping, try to slice as thin as you could or let them air dry a couple hours before hand (30 minutes if you have a dehydrator). Doing this will let them crisp faster and longer even after weeks of storage. When cooking green bean, make sure to not overcook, you don’t want mushy bean. Happy cooking, and may the best on your Thanks giving day. Wash, snap ends and cut green beans into bite size. Boil a large pot of water with a tablespoon of salt. Prepare an icy cold water bath. When the water is boiled, add green bean, cook for 5-6 minutes or at desired tender (but still crispy). Transfer green bean immediately to icy cold water bath, to reserve the bright green color along their crispiness. When beans are cold, drain and let air dry between paper towels why you're preparing the mushroom. Wash and clean all the mushroom, remove stems (save for other dishes maybe), then slice or cut into pieces. In a sauce pan, melt 1 Tbsp butter, then add crushed garlic. Stir quickly to let it brown and start giving off aroma. Now add the mushroom pieces, lightly season with some salt and freshly ground pepper. Stir until mushroom soften up a bit. In a separate bowl, combine the flour with chicken stock and dry sherry until fully mix (no lump). Pour this mixture onto mushroom, stir for a minute to fully mixed and reduce heat to simmer. Add the heavy cream and keep simmering til thickening (about 10 minutes). Taste test and adjust salt accordingly. Stir in the drained cook green bean, make sure they're all evenly cover with sauce. Remove from heat. From here on you can chill this until ready to serve or bake immediately. Thinly slice onion, soak these slice into a solution of 1 tablespoon baking soda for every cup of water. Soak for 10 minutes then drain, rinse and wash them once to remove all soapy taste. Thinly slice shallot onion as well. Let these air dried and then again with paper towel. Squeeze 1/2 a lime all over shallot slices, then mix them with onion slices and flour or cornstarch. Shake them good to have the flour cover everything. When oil is hot, stir in onion and fry until lightly golden (they will get much darker when cool). Transfer onto dripping pan/parchment paper when done frying to drip off excess oil. With your food processor, add a slice of bread, butter, and some salt & pepper to taste. Grind and blend them good. 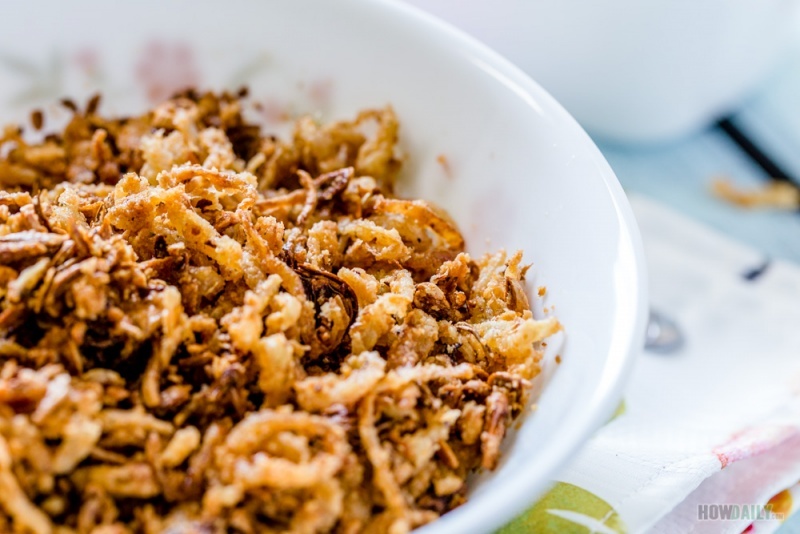 Combine this mixture with the fried onion, mix well and store until baking/serving. 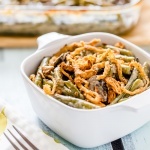 Grease your pan/baking dish and add the prepared green bean with mushroom sauce to level the dish. Bake for about 10 minutes until bubbling then add the french fried onion topping and bake for another 15 minutes. 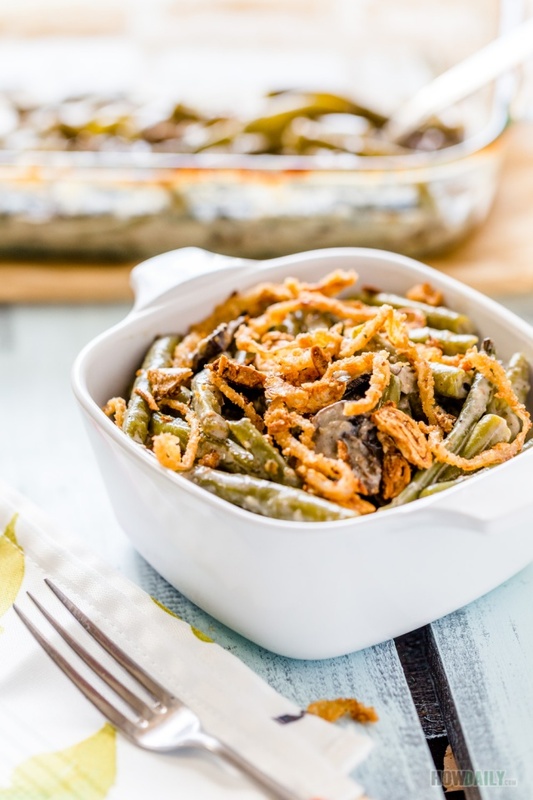 Serve the whole casserole dish with some remain crispy onion as side for extra topping.